Yesterday I found a post on Bike Rumor detailing the new bikes from Niner founder Steve Domahidy. I assume this means that Steve Domahidy is no longer with Niner? I’m thinking creative differences? He probably wanted to take Niner in a different direction, maybe a harder sound, add another drummer, or maybe his girlfriend was going to write a few songs – wait. Am I supposed to know the name Steve Domahidy? Is he really the next Gary Fisher? Is he really that big of a figure in the cycling world that people will follow him from company to company? I don’t know a damn thing about current bike companies, so I guess I can’t really make fun. He just might be a visionary, I don’t know. Anyway, the bikes; they look really nice. Two issues though; firstly, never paint titanium. 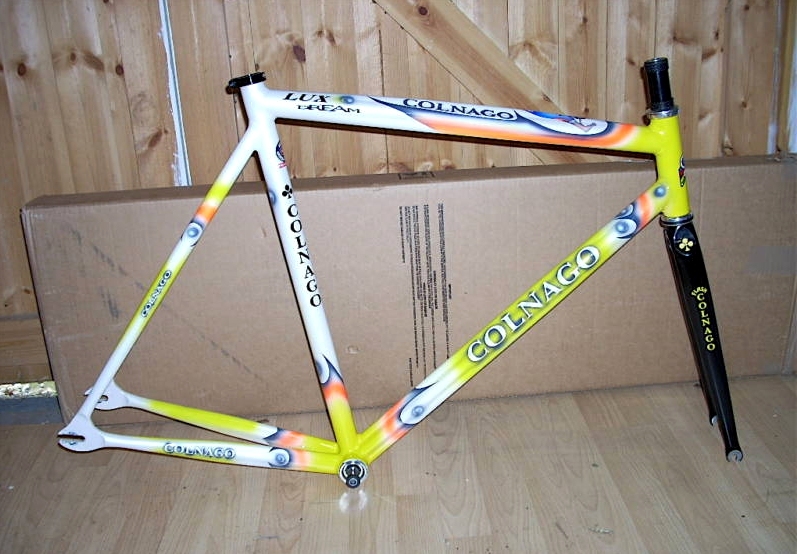 I don’t care if you’ve designed the most amazing Colnago Dream-like paint scheme that changes colour with the number of Strava personal bests you rack up on a ride, you do not cover up titanium. Titanium in person is nearly magical, to the level that no paint can achieve. You need to leave that raw. Secondly, I can’t read the name on the bike. Letters superimposed over upside-down letters – for some reason. I guess that’s cool since I don’t know who Steve Dohicky is anyway. But, the first thing I noticed about this bike – and the thing that I liked the most – was that you just don’t see new bikes without that little bend in the downtube, right at the headtube junction. You’ll find this one pretty every new bike out there. And to me, this feature more than any other, is what makes a modern bike. More than disc brakes or suspension even. Hyrdoforming of aluminium tubes has made for all kinds of wavy tubes, and you see it on a lot of bikes now. The funny part is, I honestly never knew what the point of that little jog in the downtube was. I just assumed it was modern bike designers doing it because they could. In the same sort of way that Chris Bangle felt the need to challenge people with his ugly trunk design on the 7-series BMW. Now, this would of course would be in the case of a crash, where the front wheel could potentially whip around, and the fork or the handlebar smack the bike. Designing that into the frame is pretty smart really. Though I can’t help but wonder why this wasn’t a problem with old bikes. I’d have to guess that new forks have wider crowns, and therefore are more likely to hit the frame. So, to sum up; new bikes not ugly on purpose, but still ugly. You will find no large bicycle company making bikes from steel these days. Aluminium is easier – ie cheaper – to work with, and it’s lighter. I’m sure it’s much easier to sell a light bike to the average bike buyer, than it is to try and sell the ride qualities of a steel frame. All of which makes this bike a real surprise. The 2014 Kona Explosif. Reynolds 520 steel frame, 27.5″ wheels, 120mm Rock Shox fork with 15mm axle, 142 x 12mm rear end with sliding dropouts, and a retail price of $2300. Old skool frame tubes, new skool design. It’s a mass-produced Chromag Aperture. I bought the Mountain Bike Action Buyer’s Guide recently just to see what I could buy with $2500. I don’t have $2500 by any stretch of the imagination, but it’s a dollar amount I could comfortably amass after a year of saving. I didn’t see this bike in the Guide, but it’s my clear winner.